Well, I apologize for the dormancy of the blog these past weeks. It’s been a whirlwind of activity in June. Let’s see … the kids got out of school, I had a birthday, our French friend’s teenage daughter came to stay with us for three weeks to learn English and experience a slice of Murica, we took a vacation in San Diego … whirlwind, I tell you. 1. Happy 65th birthday, NHS! 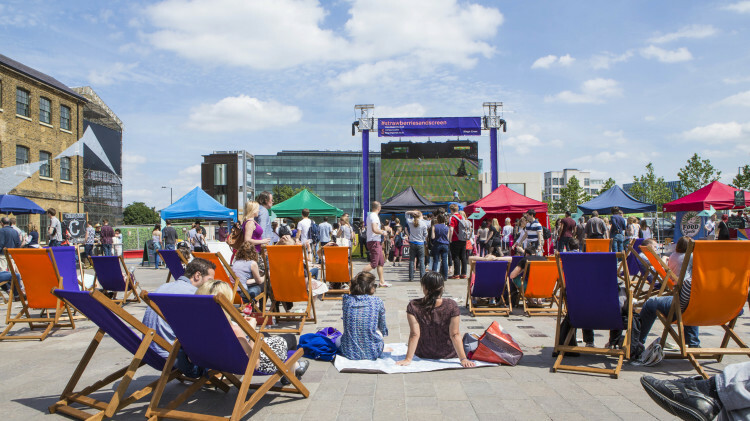 Londoners could grab a deck chair to watch Wimbledon in Cubitt Square, King’s Cross. 2. Princess Charlotte’s christening. And more importantly, comedic riffs on Prince George’s outfit. 3. This transformation of Kings Cross in celebration of Wimbledon. 4. The U.S. Women’s World Cup win! 5. Prince Philip, Duke of Edinburgh, cursing the photographer, during the 75th anniversary event commemorating the Battle of Britain.